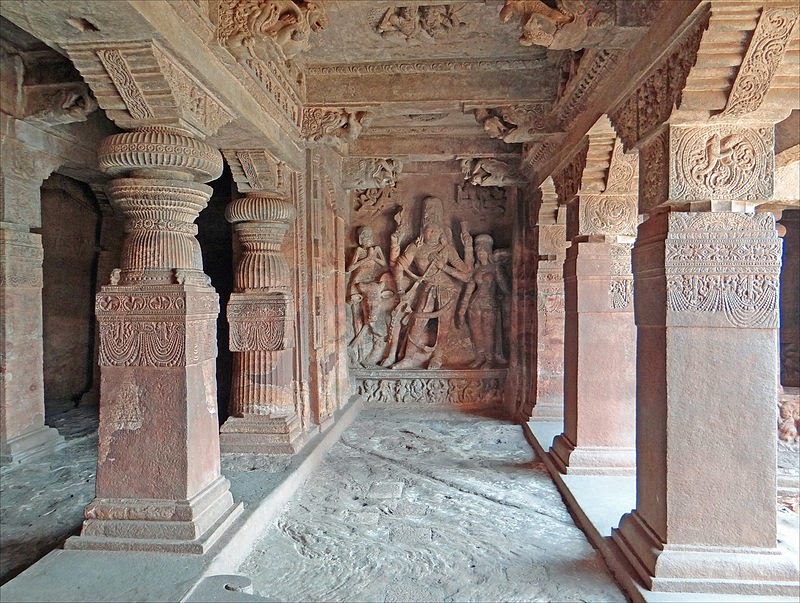 These cave temples are cut from Badami softstone rocks. You can see the pictures here and in the earlier post. You can read more details from the wiki link. I mentioned about the Hindu God, Vishnu's beautiful sculpture in my earlier post. Here some sculptures of Shiva and others in Cave no. 1. Please click on the picture and notice the minute design of the hands, the weapons in the hands of Shiva, the posture of the body, legs, etc. This is called 'Thandava Nrutya' by Shiva. In this posture, he is called Nataraja, 'Natana raja' King of dancing. Bharatnatyam, which is the Indian classical dance, the postures are derived from the postures of Nataraja here and from various other temple walls. I am not a scholar on Hiduism, so, I am stopping here and just posting the pictures, I admired! 5 ft. tall Statue of Shiva as Nataraja (the dancing pose) with 18 hands. You can see Ganesha and Nandi, the Bull too, here. This statue is on the outer wall of the cave. I wonder where the sculptors stand and do this so perfectly! I am posting this picture just to show where it is, in the cave. Nagaraja...serpent god hanging from the ceiling. Click on the pictures to view better pl. This image is on the ceiling! The guide gave a story...the sculptors lie down on the wooden ladder/saaram and cut this with broad leaves placed on their eyes which are slightly heated so that just the nerves in the leaves are there to see through and work. The stone pieces might not fall on their eyes and hurt them, though I don't think it is enough. We can just admire them. I saw many many more images on the ceilings here and other places like Ajanta, Pattada Kallu etc. This is Shiva with his wife Parvati and his vaahana (transport!) Nandi. Look at the designs on the pillars and ceiling. My picture is not this clear. Thanks to this photographer, I noticed many things here in this picture and his other pictures in the link. This is Narasimha (Nara, means human, Simha means Lion). Another avataar of Vishnu. Notice the designs on the pillars and the corners of the ceiling images. He looks relaxed here, not like Ugra Narasimha...angry faced Narasimha. Look at the details...ornaments and other images on the sides. The details of this cave are here! The is the sandstone rock from which these temples are carved. Really amazing. Many many more sculptures are there. I am covering only some which caught my eye instantly. Let me write more about this cave in the coming posts. Our country has got treasures like this all over. Let us treasure them. We should be proud to be Indians. GANATANTRA DIWAS KI SHUBH KAANAYEIN! thanks for sharing such awesome pics!!! ASHOK: You will love them...and you are an artist. Your eye will look for detail and you will analyse them better than me, Ashok. We were in a hurry to cover Badami, Aihole and Pattada Kallu in one day. That was not a good idea. Time was not enough. Plan better than us! They are too good. Amazing rock sculptures.Our history is replete with such rich and brilliant art & architecture it blows our breath away.Thanks for the wonderful post Sandhya. Awesome sculpture..Thanks for sharing the pics. those are some beautiful pics and indeed craftsman in those days had so much talent.. look at the marvellous statues they have created ..
JEEVAN: Many many more surprises are there. I was not able to move from one statue to the next. So many things to admire. Really, our people were/are great! I admire the sculptors who have done such an excellent work, even on ceilings in spite of the possibility of their eyes getting hurt. I think we should all aim to do at least one great thing in our life that will help future generations remember us, even if only in a small way. These sculptures are our inspiration! Excellent photos with very useful information. Although we live in India we are not aware of many wonderful things in the country. The country is so vast that I wonder whether any one will be able to visit all the exotic places in a life time. Really beautiful but not well maintained. You are right our country has numerous such treasures. We have such a beautiful country with amazing art and history, and every region has its own beauty. Lovely pictures, really enjoyed it. Must visit it one day. DESTINATION INFINITY: I agree with you, D.I. JOSEPH PULIKOTIL: Welcome to my space, Joseph! Yes, we have got unlimited treasures, most of them are not yet popular and so we are not even aware of them. If these types of sculptures were abroad, their govts. and people would have taken care of them better than us. We just don't give importance to our treasures. RACHNA: Yes and most of them are not known! RAMA ANANTH: These places are amazing. We have to visit and appreciate them, Rama! I have no words to express adequately the beauty and workmanship of these wonderful sculptures.I wonder whether we can create such marvels again.They seem to be maintained well despite the ravages of nature. Thanks to your great photographic skill,we could get a glimpse of the places you had visited. KPARTHASARATHY: Thank you, Partha Sir! We get overwhelmed while watching these precious sculptures! Gods apart, the designs are so intricate that we stand dumbfounded in front of them. The story about the sculptors lying and cutting the stone through the veins of the leaves sounds fantastic. wonder if it was true and if it was, salutes to those wonderful craftsmen. The nagaraja looks real! ZEPHYR: Thanks for the comment, Zephyr! However they did them, it is appreciable. They must have done all the work in daytime. It was dark inside at 4 pm itself. I was just imagining how they would have done these work, standing there...it is unbelievable. They are all our own ancestors!